First grade begins today and I'm in big trouble. It's a known fact that Mrs. Watson, the first-grade teacher, is a 300-year-old alien who steals baby teeth from her students. How do I know? A second-grader told me. Upper graders are all queens and kings of hyperbole when it comes to warnings for younger kids about school. And the worrywart heroine from Countdown to Kindergarten now has first grade to fret over, especially her teacher, said to be a purple-tongued, baby-tooth grabbing alien. And to make things worse, she HERSELF has just discovered her first LOOSE TOOTH! Our girl decides that her only defense against the innocuous-looking Mrs. Watson is to keep her mouth firmly closed all the way through first grade. This proves to be hard duty. She can't open wide to sing, and she loves to sing. She can't take part in Show and Share Time. She can't volunteer to count backwards from ten to one, and that's her specialty. She can't even have a snack at snack time. But when Mrs. Watson asks the dreaded question, "Does anyone have a loose tooth?" our girl watches with horror as the boy in front of her opens wide to show off his wiggly incisor. "MMMMMMMM!" she vocalizes, trying to warn him of the approaching danger. And then as Mrs. Watson draws closer, holding out her reputedly deadly TREAT BOX, our altruistic heroine just has to save him from his fate! And the power of her warning forces her own loose tooth right out of her mouth and into Mrs. Watson's hand. "Oh, my! I wasn't expecting THAT!" says Mrs. Watson. "Class, we have a WINNER!" says Mrs. Watson. And from inside that mysterious treat box Mrs. Watson extracts a giant "Twenty-Year" lollipop as the prize for the first lost tooth of the school year, a treat which our heroine proudly shows off to that inventive second grader as she takes the bus home after her first day in first grade. 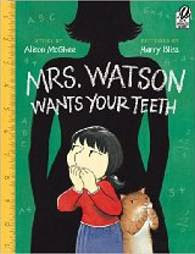 Alison McGhee's Mrs. Watson Wants Your Teeth is a great cautionary tale for taking those word-of-mouth warnings from older kids with a bit of healty skepticism. As in their earlier collaboration, Harry Bliss' humorous illustrations provide quite a few chuckles as the story progresses. For example, book posters on the wall in the first grade hall include HARRY PLOTTER AND THE HUGE CAVITY, LIFE ON THE ROAD by The Tooth Fairy, FLOSS THROUGHOUT THE AGES by D. Cay, and, ominously posted beside her door, MRS. WATSON'S LOST TOOTH GALLERY, with photos of anxious gap-toothed kids. It's a reassuring read for that worrisome countdown to the first day of school, with illustrator Harry Bliss expertly adding to the fun.